TrafficVis allows you to step through a dataset of traffic data from the New Zealand State Highway network from February to May, 2017. The header provides a number of controls for navigating through this time period. The time controls allow for the playback to be played and paused . The speed of playback can be sped up or slowed down . 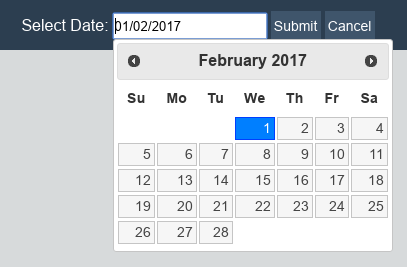 To quickly move to a different date, clicking on the date label will open a date selection field. TrafficVis offers a number of widgets that can be used to explore the data. Widgets can be added by opening the "Widgets" drawer at the top-left corner, and dragging widgets from the drawer onto the dashboard. In order to move or resize widgets, press the "Edit Mode" button in the top-right corner. You can now move widgets by dragging them around the dashboard, or resize them by dragging from the edges of a widget. Make sure you save the layout using the same top-right button before interacting with the widgets. 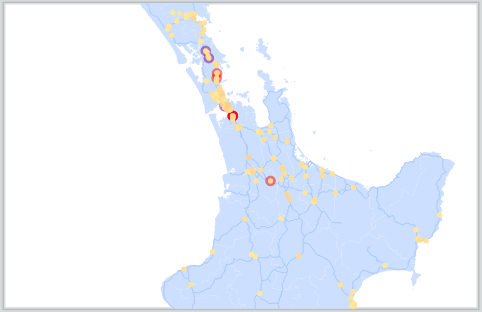 The data explored by TrafficVis is gathered from a number of sites across New Zealand. Each site is shown on the Map widget as a circle, coloured according to traffic volume. The more red the circle, the more traffic passing through the site. You can drag your mouse to pan around the map, or scroll to zoom in and out. Sites are also highlighted when experiencing abnormal traffic behaviour. A site is highlighted red when experiencing more traffic then predicted, and purple when experiencing less. Note: The map is also used to populate other widgets. You can drag individual sites from the map onto other widgets in order to display the site on the charts. 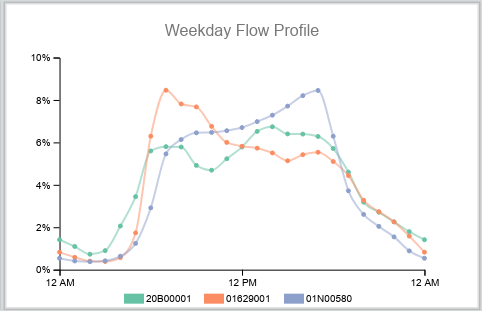 The flow profile widget displays the distribution of traffic throughout the average weekday for each selected site. Sites can be selected with the mouse, revealing a red "x" to remove the site from the widget. 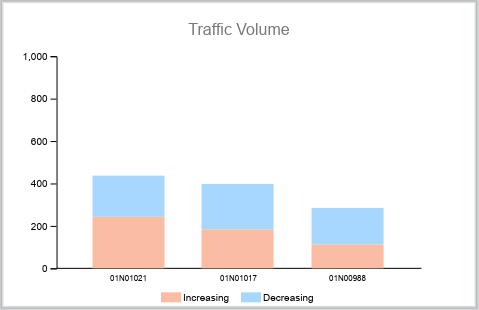 The bar chart widget displays the current traffic volume of the selected sites. The bars are coloured to show the increasing (usually northbound) traffic, and decreasing (usually southbound) traffic. Bars can be selected with the mouse, revealing a red "x" to remove the site from the widget. 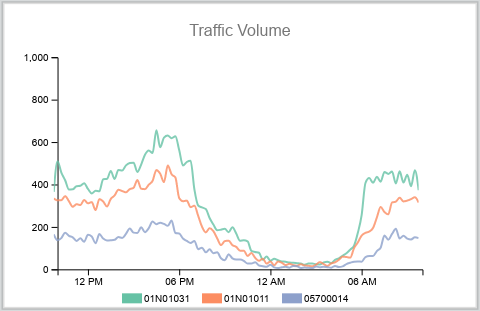 The line chart shows the previous 24 hours of traffic volume for the selected sites. TrafficVis also incorporated machine learning techniques to predict the traffic volume expected for each site. 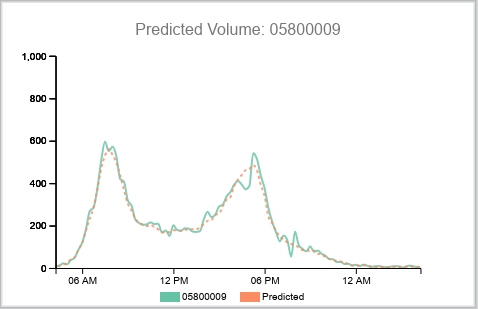 The Traffic Prediction widget is a line chart showing the traffic volume for a selected site, alongside the traffic volume that was predicted. If you wish to view the average traffic volume across a larger region, instead of looking at individual sites, TrafficVis also offers "Regions". The Regions drawer in the top-left corner contains a number of predefined regions which can be dragged onto the above widgets. At the bottom of the regions drawer, there is a button that allows you to define your own regions. 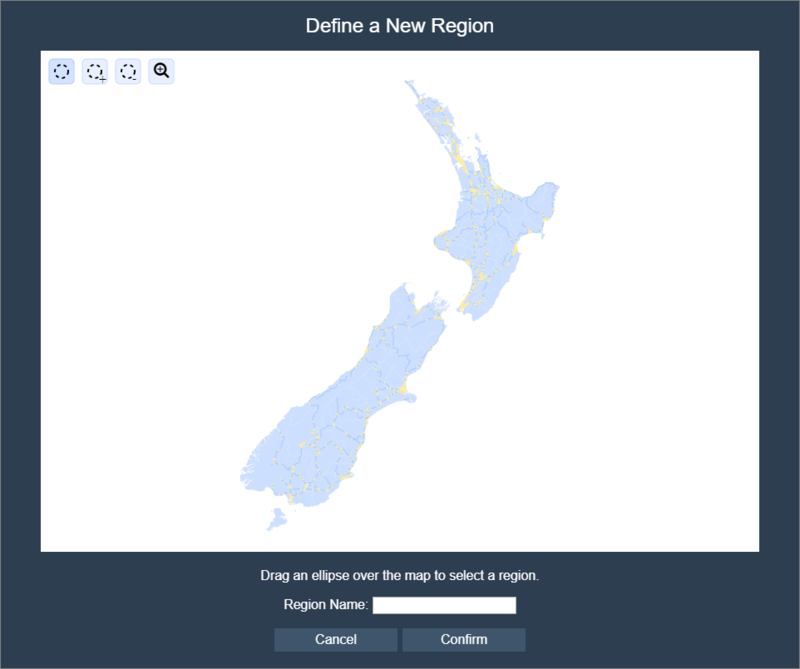 The region selection window offers a map which can be used to select a region of sites. Four tools are offered in the top-left. The first tool allows for a circular region to be selected. The second tool allows for a circular selection of sites to be added to the current selection. The third tool allows for a circular selection of sites to be removed from the current selection. The fourth tool allows you to pan and zoom around the map. A new region must be given a name, and the name must not be used by any other regions. Any feedback on the prototype or project is always appreciated.